We stock a variety of banner materials for different applications. We stock vinyl banners for short term as well as long term displays; whether you need an affordable banner to display for a couple years or less, or need a banner that going to hold up for years to come. We stock PET banner material for pole pocket banners and top hanging banners; the PET material is anti-curl meaning the banner will hang flat even if it’s not hemmed, it also has a smooth finish making them great for indoor banners. 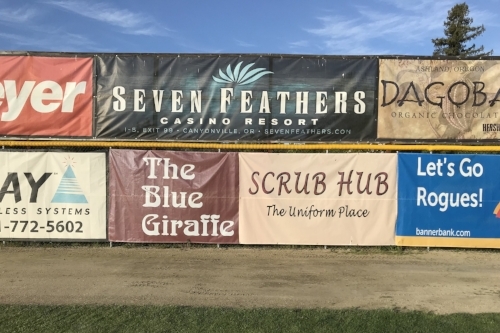 We stock mesh banner material for fence banners as well as banners being hung in high wind areas; the mesh material allows wind to pass through the banner making it so there is less tension and stress on it. We also stock specialty banner materials such as hydrosol (used for pop-up banners) as well as canvas that can be done flat or wrapped onto a custom made frame. Certain banner materials can be done 2-sided, and all banner (except for hydrosol and canvas) come with all 4 sides hemmed and standard grommets. If you need help finding the right banner material for your project just contact us, we're always happy to help.